When Bill Green, director of the Ktunaxa Nation Council/Canadian Columbia River Inter-Tribal Fisheries Commission asked, “What if we could bring the Salmon back within a century of their loss?” the question prompted consideration. Was Salmon loss necessary? Was it forever? The Salmo Watershed Streamkeepers Society (SWSS) within its ‘The River Speaks’ awareness campaign reached out to the local Artist community to explore the questions and issues surrounding Salmon Reintroduction. On May 8th and 9th, 2014, SWSS hosted twenty-one Artists, who came together for the Let Them Run, The Salmon Century experiential learning adventure that focused on Water, the Columbia River Treaty, and the challenges, benefits and successes of Salmon Reintroduction. Gaining insights, Artists were asked to use their skills to create artwork that defines the meaning, challenges and benefits of Salmon Reintroduction so that they can bring awareness to Basin residents of a loss that can be regained. This Artist Exhibition staged its first Opening Reception at the Kootenay Gallery in Castlegar, BC on September 26, 2014. During its 6-week exhibit, public interest was spirited, attendance was high, and the exhibition received an overwhelming amount of comment. And now, the Columbia Basin migration has started. 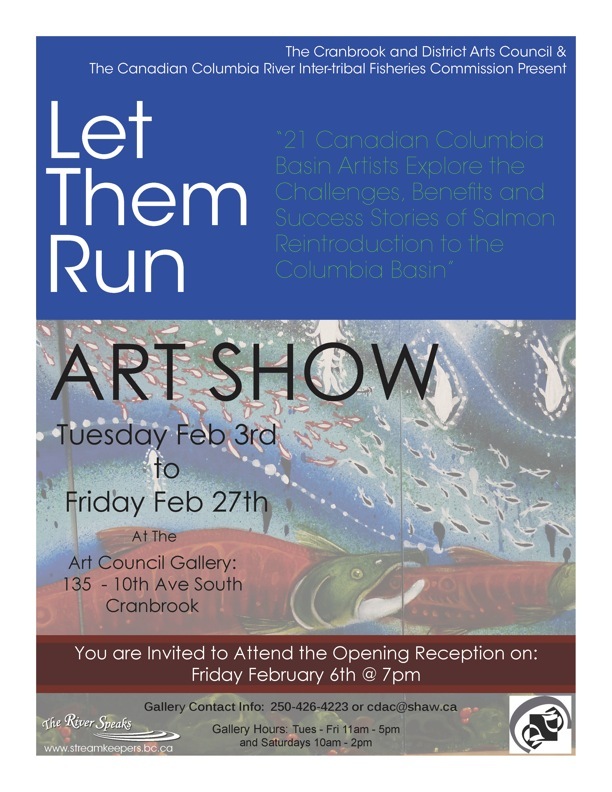 We hope you, the viewer, will gain insights from this Artistic Reimagining exhibition and advocate for Salmon to be reintroduced to the Canadian Columbia River Basin. Imagine Salmon spawning in the Canadian Columbia River Basin again . . .